Stanley MaxLife 369. Illustration courtesy of Stanley Tools. 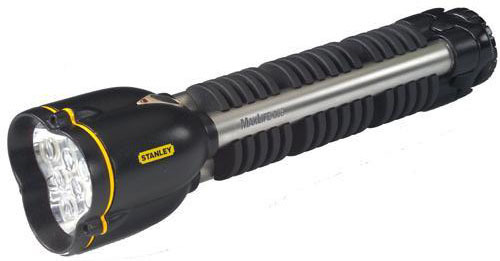 Stanley Tools offers the "MaxLife 369" LED flashlight / table lamp with a self-contained, folding, 7" tripod and a set of three colored filters (red, blue and green) that simply push into the front of the light head. The light head tilts through an arc of about 100 degrees. To vary brightness, you can select to use one, three, or all six of the lamp's LED's. Three batteries fit in each leg of the tripod, which also serve as battery compartments, and the light will run on three, six, or a full complement of nine batteries (not supplied). It runs for up to 200 hours on a set of nine AA alkaline cells. Using fewer batteries does not diminish the brightness, but it does decrease the run time. The batteries are loaded by unscrewing the tripod's feet. With its tripod legs folded, the MaxLife 369 serves as a conventional flashlight. Push the small button below the pivoted light head and the tripod legs pop out, converting the MaxLife into a small table lamp. Because of its versatility, this nifty light has many field applications and it will serve hunters, campers and amateur astronomers out for a night of telescoping with aplomb. I can also see it as part of an automotive emergency kit, where it would be a very handy if you had to, for instance, change a tire on a dark and lonely road some night. In addition to its built-in 7" tripod legs, three light output settings and pivoted head, MaxLife 369 features include a low power indicator that flashes to warn you that the batteries are nearing exhaustion. There is a simple 4-position, push-button switch to select off, low, medium or high power and six bright-white LED bulbs that never need replacing. Here are some specifications. Colors: Black with silver legs or camo. I was not able to fine any kind of brightness specification, but with all six LED's illuminated, the MaxLife 369 puts out plenty of blue-white light. Even with just one LED illuminated and the red filter in place, it is still too bright for the liking of amateur astronomers, who will want to add a layer of transparent red film to the supplied red filter to help preserve their night vision. The light pattern is a bright, defined, center circle with a wide, but much dimmer, surrounding circle. It is the sort of combination spot and flood pattern delivered by many LED lights. With its tripod legs unfolded, the MaxLife 369 is reasonably stable as a tabletop lamp. The head pivots through about 100 degrees, from straight up to angled slightly down when the lamp is standing on its tripod. I would like to see Stanley increase the amount of pivot to make the head point down more, thus making it easier to get the light directly on a chart, book or manual when the MaxLife 369 is used on a table as a reading lamp. Overall, the MaxLife 369 is a well-designed, versatile light that does a good job as a flashlight or a table light. It should be very popular with campers. Its variable battery capability might be handy in situations where you run out of replacement batteries and amateur astronomers, in particular, will appreciate the included set of colored filters.